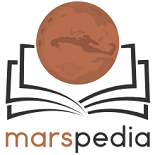 Marspedia is an official project of both The Mars Society and The Mars Foundation. Individuals from The Moon Society have also been involved with Marspedia since the beginning, as well as its sister wikis listed in the left navigation. The Mars Society was founded in 1998 and our goal is to explore and settle the planet Mars. The Mars Foundation was founded in 2004 to promote the permanent settlement of the planet Mars. Marspedia's domain expenses are covered by donations from the Mars Foundation and individuals with shared interests in the goals of the Mars Foundation. In October 2017, the Marspedia Governing Council was formed between these three organizations to manage and grow the wiki. Currently, Marspedia is composed entirely of English-language articles. In time, and when established as a leading source in Mars-based information, Marspedia may be translated into a selection of modern languages to improve accessibility for international users. For now, we ask all users to create articles in English. We are more open to material types than Wikipedia, and less interested in deleting material. Specifically, Wikipedia enforces a rule that all entries must NOT be "original work". That rule does not apply for Marspedia, we are very happy for you to post original work, provided it is not copyright. Therefore there is not so much duplication between Marspedia and Wikipedia as you might expect. For example, the Marspedia page on Insert Appropriate Link Here contains interesting material which under Wikipedia rules would be deleted because it is "original work". Note: Once "original work" has been published on Marspedia, then anybody could put on Wikipedia a link to the Marspedia article, and that might be OK for Wikipedia as it would no longer be original work, and references are usually accepted over there. For those cases where you want to reference it elsewhere, we could arrange for it to become read-only protected. Wikipedia enforces a requirement that all articles about people or organizations must demonstrate why the subject is "notable". There is no such requirement on Marspedia, although there is a general expectation that it should somehow be related to Mars development. You can advocate positions, but expect to be challenged. Conversely, do not just delete material you do not agree with, but feel free to add a rebuttal. Marspedia uses the latest stable version of Mediawiki, so in many respects it is very similar to Wikipedia. Marspedia is now using a new and experimental Visual Editor. Please report any problems to James Burk, who set it up. [[exd:Sandbox]], [[lunarp:Sandbox]], [[marsp:Sandbox]] and [[spacep:Sandbox]]. exd:Sandbox, lunarp:Sandbox, marsp:Sandbox and spacep:Sandbox respectively. [[exd:Azimuth]], [[lunarp:Carbon economy]], [[marsp:Mars Express]] and [[spacep:ISDC_2007]]. exd:Azimuth, lunarp:Carbon economy, marsp:Mars Express and spacep:ISDC_2007 respectively. The interwiki prefixes on the other sites are identical. This page was last edited on 18 November 2017, at 17:35.